That's right. 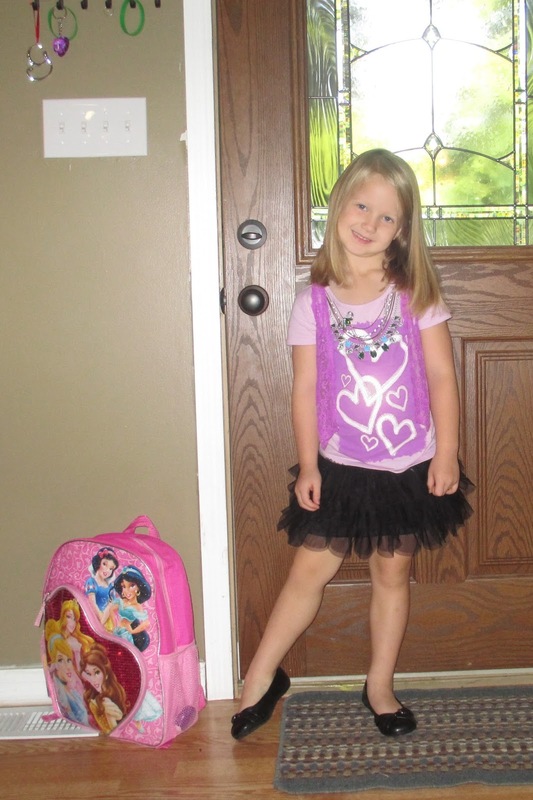 My baby girl started kindergarten! I am so excited for her to begin this next journey in her life. And so is she. We are blessed in that her preschool extends thru kindergarten, so she will stay at the same facility. She is in the same montessori classroom she has been in since turning three. They will have concentrated kindergarten instruction for two hours every afternoon (coincides with nap time for the younger kids), as well as continuing the montessori approach the rest of the day. There are only six kids in kindergarten, with two teachers who rotate as "lead" teacher. For those who are good at math (or maybe just memory), yes she is only four years old. Yes, we are starting her early. In fact, besides that we love this school and the montessori approach to education, being able to start her early was a big factor in deciding to stay here. Because why else would we pay private school tuition, right? Well, there were several factors really. 1) Starting her "early". In Kentucky, she misses the cutoff date by less than a week. So while technically she is starting school early, if she had born just one week earlier it would be "on time". After talking to several different resources in the state, we realized that the public school system makes it really hard to start early. The cutoffs are firm, and the only way around them is to subject your child to rigorous testing in an effort to prove they are ready. 2) After school care is taken care of. Since her current facility operates as a daycare / preschool / kindergarten facility, she can stay in one location the entire day. Our local schools have half-day kindergarten. While great for instruction, a nightmare for families with two working parents. We're pushing off the after-school care issue for another year by keeping her in a facility we know & trust. 3) Top-notch education. The facility she is at provides a quality education in a montessori setting. With small classes and excellent teachers who believe in continually challenging kids to reach their fullest potential, we couldn't be more pleased with the education she is receiving there. 4) Continuing her progress. I've written before about our concerns in how to handle Jena's apparent giftedness in certain areas. While she has yet to be formally evaluated, we did recently have a local school administrator, after only talking with Jena a few minutes, and with no comments from us, suggest that we learn a new word in our home: "gifted". Our evaluation appears to be correct. We mentioned to her teacher that once informal kindergarten assessments are done, we'd like to sit down with her to review them, because we want to make absolutely sure that they know where she is. She immediately responded by telling us that while of course she will be happy to sit down with us after assessments are complete, she already knows that not only is Jena more than ready for kindergarten, she is the most advanced student in the class, despite being the youngest, and both kindergarten teachers have already discussed how to continue challenging her. Though we're still uncertain exactly how we will proceed in the years to come, we feel confident that by leaving her at this facility she will continue to grow and develop in her abilities. In short, this is a good fit for her. And so, for all of the reasons above, we started our daughter in kindergarten a year "early", at her current preschool facility. Wish us luck for a successful first year of school!